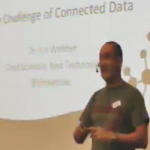 Jim Webber discusses how connected data is driving new classes of innovative applications and investigate the strengths and weaknesses of common NOSQL families for dealing handling it. The focus is on the characteristics of Neo4j for managing connected data, and to reinforce how useful graphs are, he provides a rapid, code-focussed example using Neo4j covering the APIs for manipulating and traversing graphs. He then use this knowledge to explore domains as disparate as social recommendations and the Doctor Who universe, using Neo4j to infer knowledge from connected, semi-structured data.